I dislike attending funerals, especially Chinese funerals. I don't know why, but the atmosphere at funerals give me the creeps. And the music played sounded especially horrible to my ears. I remember the time my grandfather died when I was very little. I was not very close to my grandfather. He stayed in my uncle's house and I seldom visit him. When he died, my family had to attend the funeral at my uncle's house. That night when I entered my uncle's house, I saw a huge coffin in the hall. As I was very small, I did not know any taboos related to Chinese funerals. The coffin was higher than me so I was eager to climb up to have a look. When my mom saw what I was trying to do, she quickly pulled me aside. I don't remember what she said at that time, but it had somehow instilled a fear in me. That I was not supposed to touch coffins or dead people! Then I saw my aunt putting something into the coffin. When she had done that, she started to cry. I asked aloud to my mom why was auntie crying? Was her fingers stuck in the coffin and she hurt herself when she tried to pull them out? Everyone laughed at that point. Even my aunt. I was slightly embarrassed. That was my first experience of a funeral. Much of the details I could no longer remember. But a few days later, I remember seeing this ceremony at my uncle's house. It was related to my grandfather's funeral. A man dressed in old traditional Chinese costume was jumping over a fire. I do not know what ceremony was that to this very day. Anyone knows? The man would jump over the fire, but before he jumped, he would fill his mouth with wine. As he jumped over the fire, he would spit out the wine onto the fire causing it to flare up high. It was a spectacle to watch! I even imitated his actions when I got back home, minus the fire and the wine, of course! I just used a toy pail to represent the fire and jumped over it! Haha! Many years later, my grandmother died. At her funeral, there were talks about keeping the cats all caged up. Especially black cats. It seemed that there were many stray cats at her house. When I learnt why they had to cage up those cats, my hair stood on end. It seemed that if a black cat were to accidentally jump over the corpse, the corpse would spring right up! This story had haunted me for days and gave me sleepless nights! I also learnt that it was taboo to see the coffin being nailed shut. I was so curious I almost wanted to see how they nailed the coffin. But I did not. Fear kept me from doing so and I kept my head bowed and my eyes closed during the entire process. When we returned home from the funeral, my mom would make sure that I and my siblings washed our feet outside before entering our house. My mom said that was to prevent bad luck from following us home. Of course, I heard a more fearful reason later on. It was not just bad luck. It was to prevent evil spirits at the funeral from following you home! I still wonder to this very day if these are all nothing but just superstitions. Will a cat jumping over a dead corpse causes the corpse to wake up? What will happen if you watch the coffin being nailed? And what will happen to you if you forget to wash your feet and enter your house after attending a funeral? If you have not been following my blog for the past week, you may want to read this first. With our luggage in tow, we walked to our next lodging, which was Xi Jie Youth Hostel. The tour guide told us it would be a very short walk, about only 300 metres. We soon discovered what she said was absolute crap! We walked for more than 300 metres but there was still no hostel in sight! As we continued walking along the road, a lady approached us and asked where we were heading. After telling her of our intended destination, she said it would be too far for us to walk and it's better we take a taxi. We were reluctant at first, but after walking for some time (with the lady following closely!) we decided that her advice made sense. But we didn't flag down a taxi! Instead, we went for something more unconventional - a man on a three wheel bike with a large wooden box behind. I thought the box was for our luggage but no, the box was meant for us too! So all three of us placed our luggage in the box and then did what I at first thought was impossible. We sat at the edge of the box - yes, the three of us squeezed ourselves into that limited space together with our luggage! This must be the first time in my life traveling on the road this way! If we were in Malaysia, we must have looked really funny! But this was China, and no one gave us a second look! Either that or I was holding on too tightly to notice! I managed to take a photo while riding on that bike. We were all seated behind the driver hanging for our dear lives as he drove around the streets of Yangshuo. There was a problem, however. 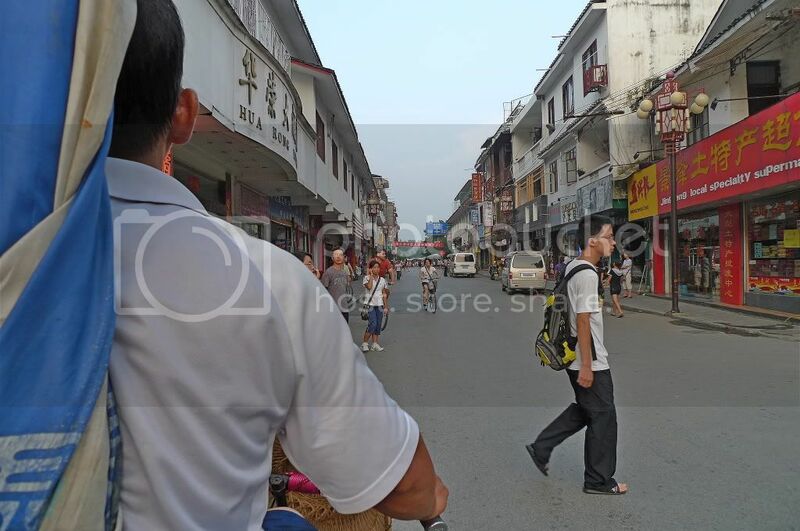 The driver did not know where Xi Jie Hostel was located and we ended up at the wrong street! Luckily Jam passed him the contact number of the hostel and after calling the hostel and was given the right direction, he brought us to the correct place. We paid him 15 yuan for the trip. I thought it was fun sitting on that bike! Luckily, we did not walk all the way. It could easily have been more than 1 km from where our tour bus dropped us and not 300 metres as claimed by the tour guide! Thomas, the boss of Xi Jie Hostel was there to greet us. He helped us carry our luggage. 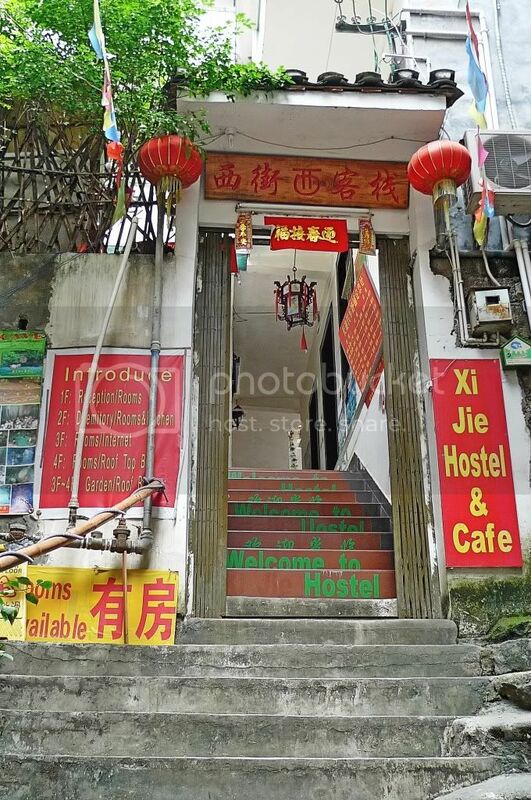 This is the entrance lane to Xi Jie Hostel. 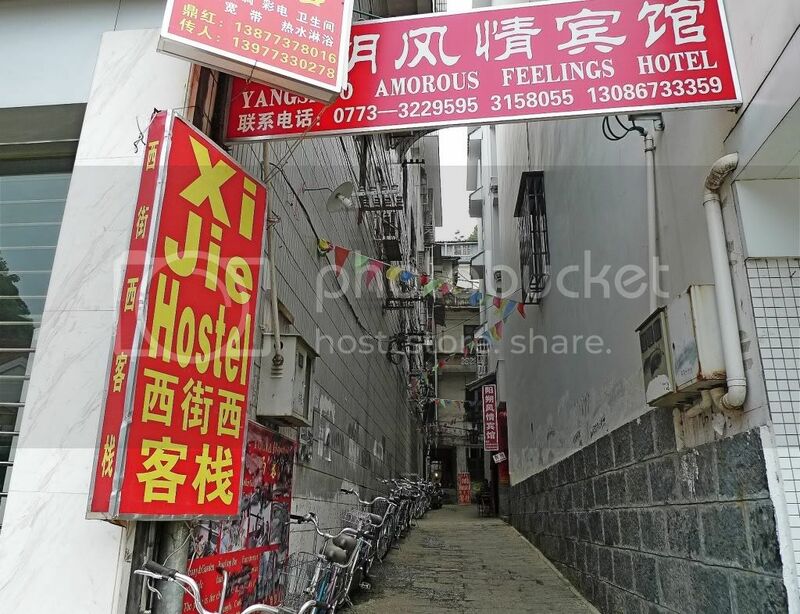 But my attention was diverted to the other signboard above - Yangshuo Amorous Feelings Hotel. What a name! See the row of bicycles on the left? If I am not mistaken, those were bicycles for rent. And I saw a two seater! Jam had told me that we would be cycling around Yangshuo countryside. Since I do not know how to cycle, I need to ride with someone who does! So a two seater would be good for me. Alas! We did not have the opportunity to do any cycling. I will let you know the reason in my future post. We reached the front entrance of Xi Jie Hostel. There were many steps going up. And Thomas had given us a room on the 4th floor! Gosh! Luckily he was carrying some of our luggage for us! 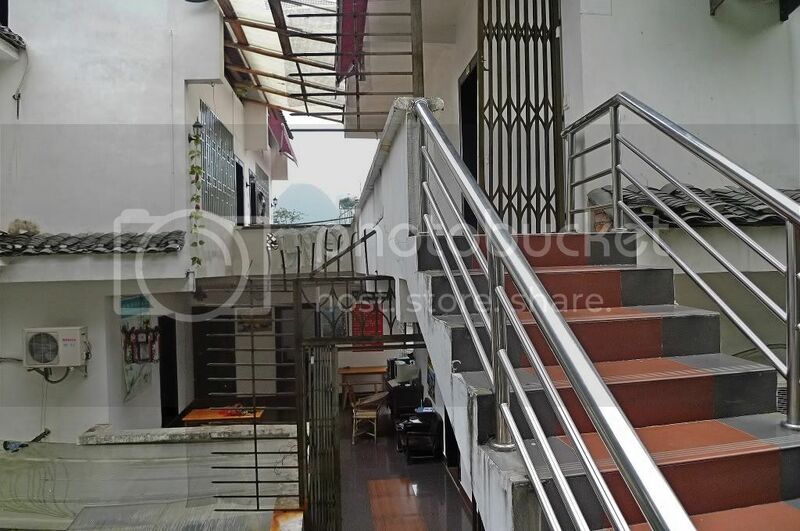 As we followed Thomas closely and climbed up the stairs, we could sense that this hostel was rather unique. 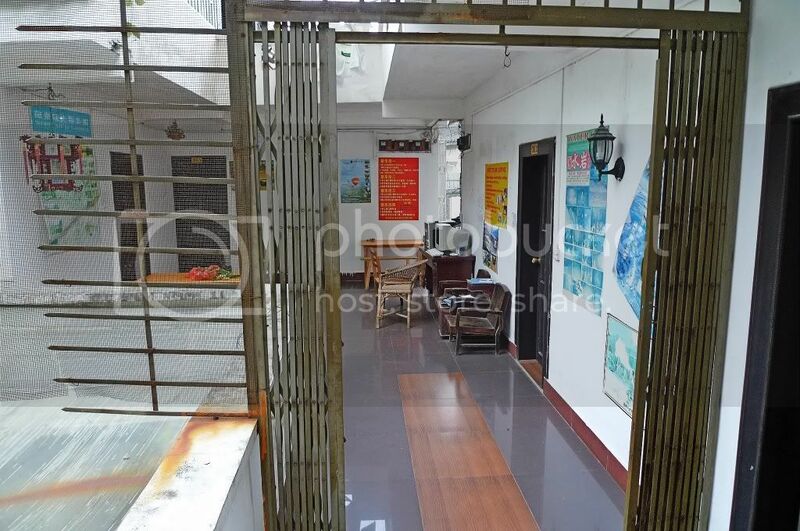 Located at Pantao Road, next to the Post Office and behind the Industrial And Commercial Bank Of China, Xi Jie Hostel was just 3 minutes walk to the Yangshuo Bus Station and a minute walk to the famous West Street. Location wise, it was perfect! The building itself looked as if it was built into the side of a mountain as there was even a natural cave in the hostel! Sorry no photo of the cave - I hope Jam had taken a photo of it! This is the 3rd floor where a computer was placed in the hall. Guests could use the computer and internet for free. Climbing further up, we reached the 4th and top floor which was also the rooftop. This is the view from the roof top! I won't say it's breathtaking but it's charming in its own way. I thought the sun casting a reddish glow in the sky was really quite beautiful. 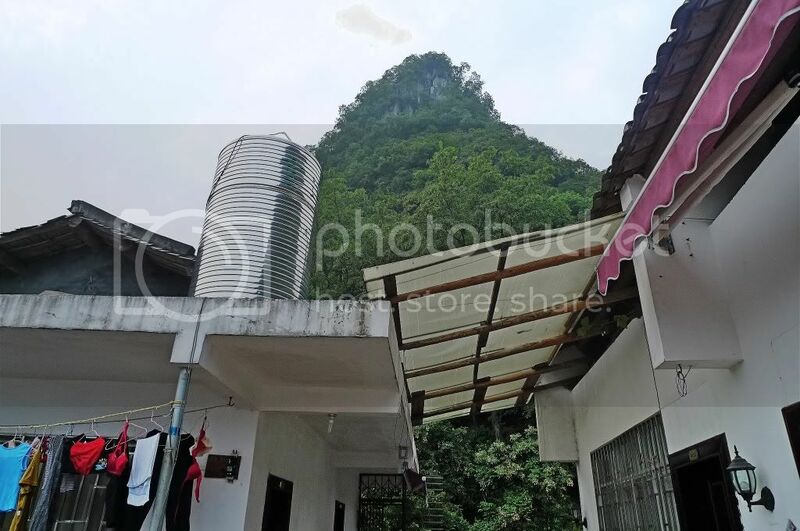 And what better way to relax than to sit at this roof top having a drink and chit chatting with friends while enjoying the magnificent view of the karst hills! By the way, that cigarette pack on the table was not ours. Neither me, Jam nor his friend smokes. But did you notice that hat on the right? No prize for guessing whose hat that is! This is the place for hanging your laundry to dry. It was nice to see the green mountain right next to the hostel. We were led to our room which was actually made up of a big room and a smaller room next to it. 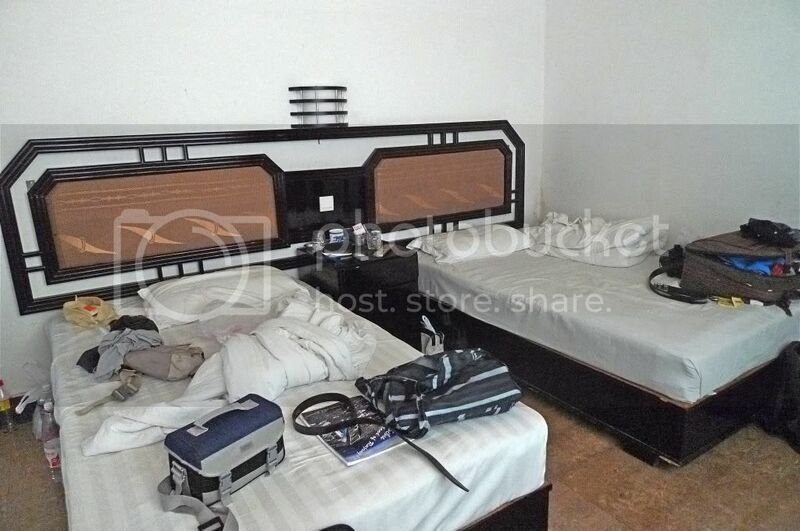 Jam and his friend took the bigger room which had two beds while I took the smaller one. This is my room complete with a bed, a table and a table fan. Why table fan? Well, my room had no air conditioner whereas the bigger room had one! That's not very fair, right? Why did Jam bully me and force me to take the small room? OK, just kidding here! I opted for the smaller room out of my own free will. At first, I thought if I slept without closing the door to my room, the cool air from the air conditioner would enter my room. But somehow it did not work out that way. It felt quite stuffy in the room and so I decided to close the door, switch on the table fan and open the window in my room. 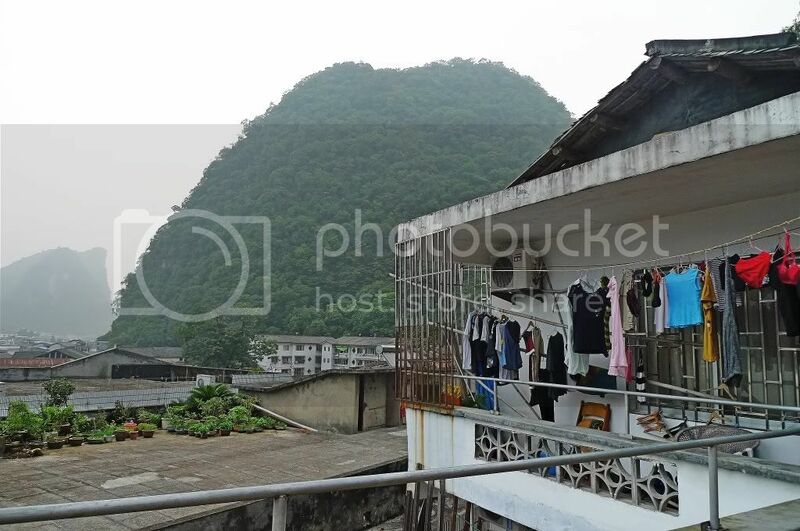 Although this hostel was cleaner than Backstreet Youth Hostel in Guilin and not as run-down, I was far from satisfied with it. For one, I saw cockroaches in my room and if you don't already know, I hate cockroaches! They are the world's most disgusting and filthy creatures! I had to kill them before I could have a good night sleep! I simply could not imagine letting them climb all over me while I slept. Yucks! Secondly, the shower in the bathroom was utterly hopeless! The water that came out from the shower was like a dribble. I guess maybe the water pressure was not strong enough. We had to resort to filling up a pail with water from the tap on the wall and use the bucket to take our bath! Luckily, the saving grace was Thomas, the hostel boss himself! He had been very friendly and accommodating throughout our stay here. But of course he being a Chinese businessman, nothing was like what it seemed. At our very first meeting, he started to promote his tour packages to us. He recommended us a few packages but we finally decided to take up the Yulong River rafting and the "Impression Liu San Jie" show. 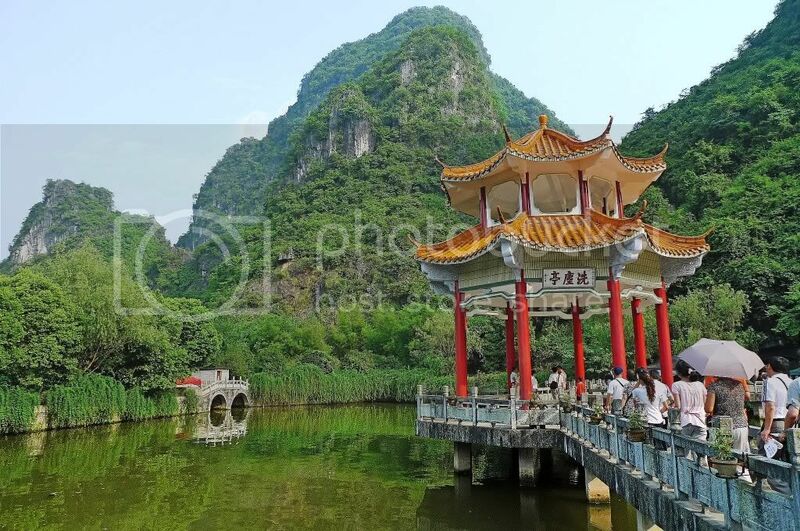 We had already planned to see the "Impression Liu San Jie" show under the tour company's package earlier that also included the Li River Cruise and the Yangshuo tour. But since we have now absconded and would not be paying them, we would have to buy the tickets to the "Liu San Jie" show ourselves. But with Thomas offering us VIP tickets at 238 yuan per ticket and free transport to the show and back, we thought it was a pretty good deal. The Yulong River rafting would cost us 200 yuan per person. I really do not know how much he had marked up the price, and if these were really good deals, but Jam said it was comparable to prices offered by tour agents online. 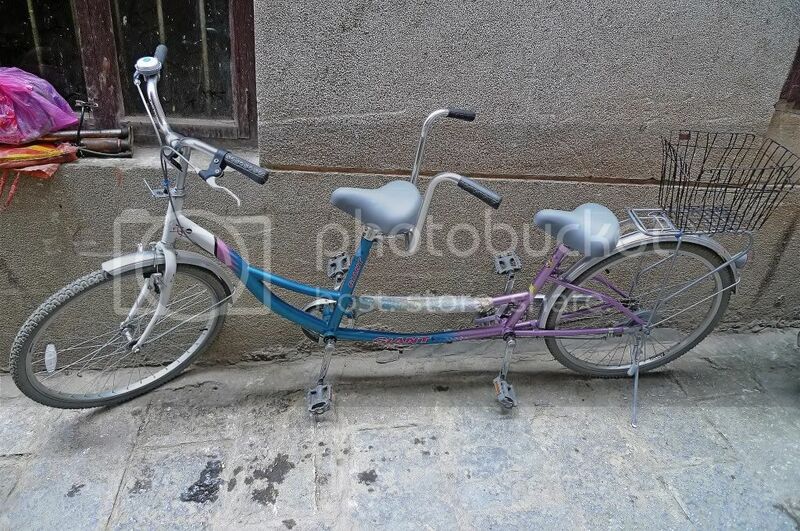 Besides, Thomas also threw us a freebie, which was free rental of bicycles. After checking in and resting for a while, it's time for dinner! 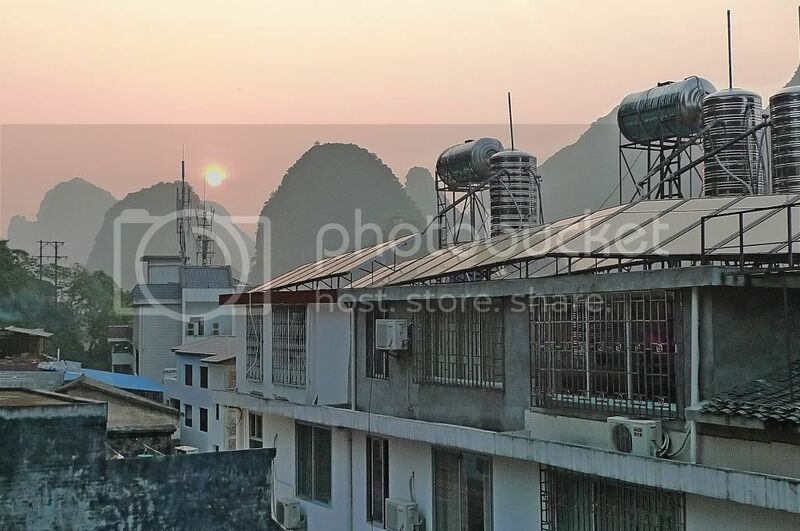 But first, we wanted to explore the very famous tourist street in Yangshuo. It's called West Street. And in case you do not know, Xi Jie means West Street in English! Two weeks ago, I received a mail in the post box. 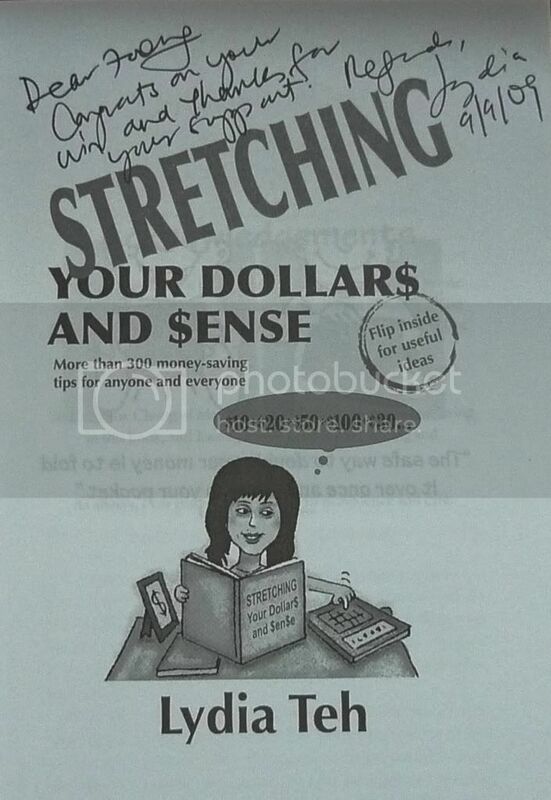 When I opened the mail, I found a book called "Stretching Your Dollars And Sense" by Lydia Teh. It was Lydia Teh herself who mailed me this book, which happens to be her latest book. I had just won a contest on her blog and this book is the prize. Thanks Lydia! And oh, she also left me a personal message in the book. Cool! 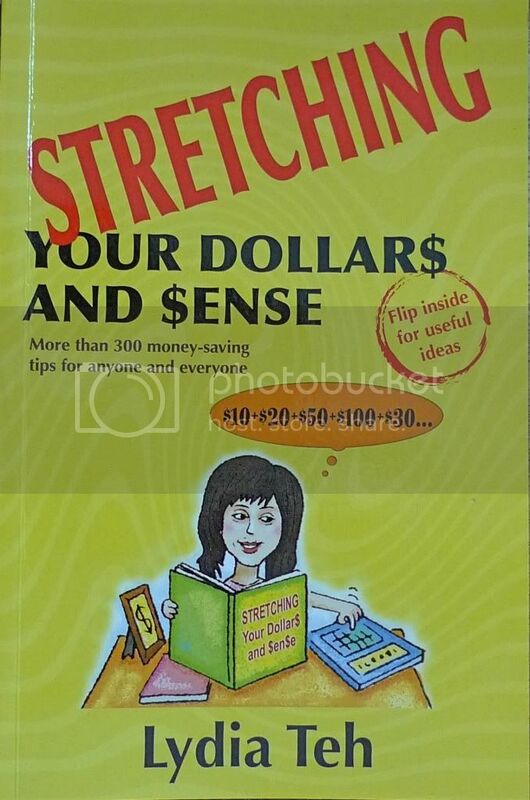 I have yet to read this book but I am sure it will come in handy especially at times like this when we need all the tips available to stretch our money! By the way, I am a big fan of her other two books which I have finished reading some time back. "Honk! If You're Malaysian" was thoroughly entertaining and utterly enjoyable! 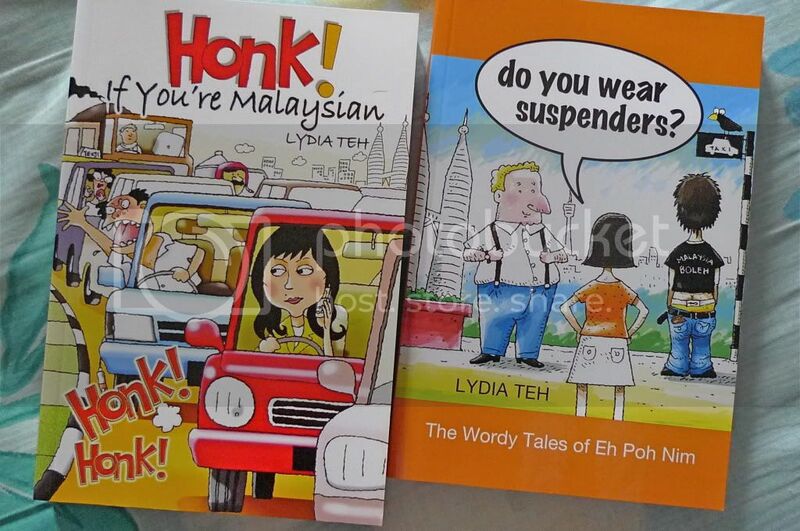 It was Lydia's amusing view on Malaysians' way of life. As for "Do You Wear Suspenders?" I think it must be the best book to brush up on my English! Funny and interesting at the same time, I enjoyed reading every single page! If you have yet to read these books, I highly recommend them! They are guaranteed to make you laugh or at the very least put a smile on your face! OK. I will try to make this post short and straight to the point. Did we pay the tour company? That's what you all wanted to know right? Leaving Ju Long Tan and Exotic Stone Palace, the tour bus brought us back to our respective hotels. 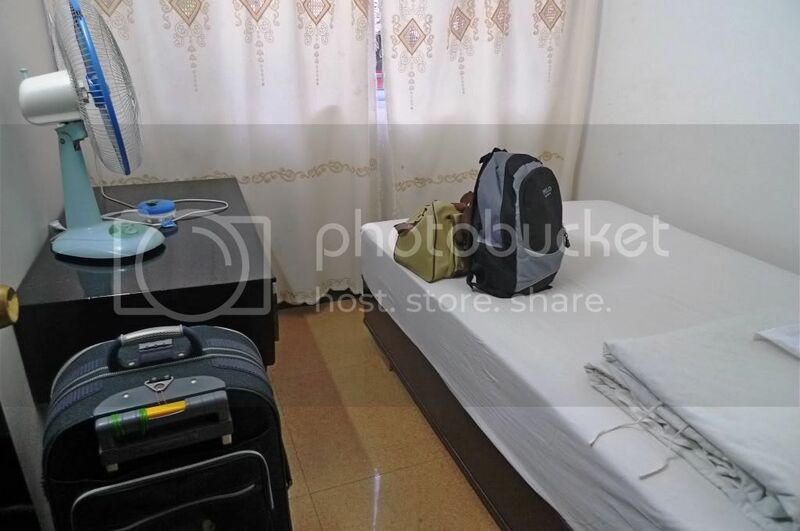 In our case (that is me, Jam and his friend), it was not a hotel but a hostel. 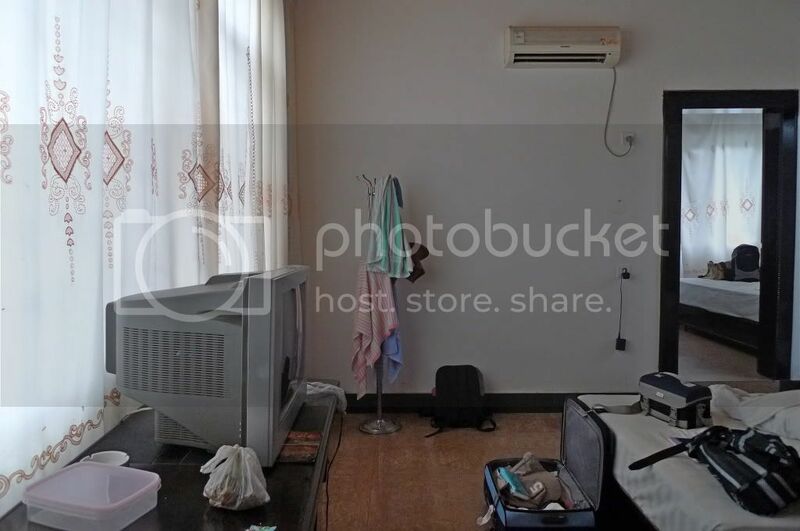 Or more specifically, the Xi Jie Youth Hostel. But guess what? The bus did not stop in front of Xi Jie Hostel. It stopped somewhere and the tour guide told us the hostel was only 300 metres away. So walking there would be no problem. Well, walking there without carrying anything would surely not pose a problem, but with all the luggages we had to carry, you wanted us to walk? OK, we were not going to fight with her over this. We were even so nice as to ask her if we could pay for the tour even though we did not feel like paying! She said she was not the person responsible for collecting the tour fees and asked us to contact the tour company directly. When I heard this, I was on cloud nine. Haha! This was exactly what we wanted! It's not that we did not offer to pay. No one wanted to collect the payment from us. Nobody made any effort to contact us about it. Which was damn fine with us! So bye bye and good riddance! With that, we stepped down from the bus, took our luggage and proceeded to walk to the hostel. We were feeling so good about this. There was no way for the tour company to contact us for the payment. They did not have any of our contact numbers! Besides, if they really found a way to contact us, we could just ignore the calls. Haha! Of course, they could track us down to Xi Jie Hostel since the tour guide knew we were staying there. But during our two nights stay there, no one contacted us. 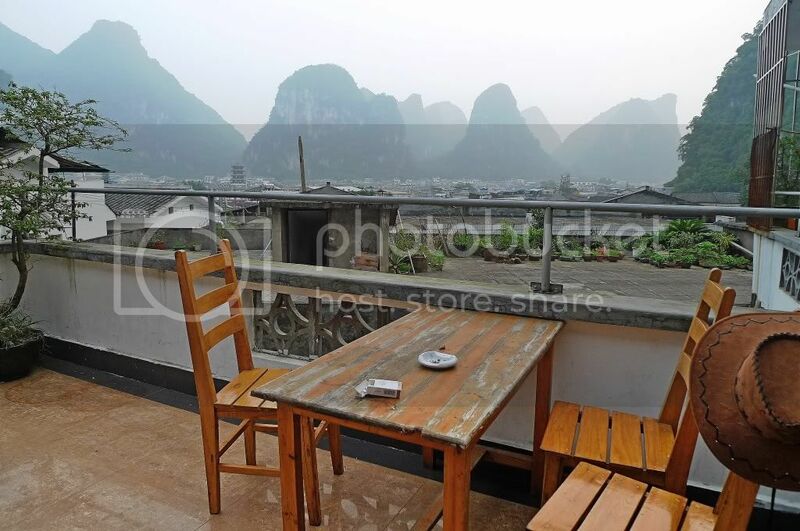 Jam and I were already thinking how much we should splurge in Yangshuo! Haha! Yes we won! We outsmarted them! Hooray!! But deep inside, I do believe in karma. And karma works in mysterious ways. I still could not believe that it would be so easy! For the moment, it's victory for us. But would they come hunting for us? We still had another 5 days in China. Anything could happen. And if you want to know whether there are further developments to this saga of the Malaysian tourists vs. China Tour Company, you just have to be patient and keep coming back for updates. Sorry there are no photos for this post, especially to those of you who are expecting some photos! But rest assured, you will be seeing more photos of my China trip in my upcoming posts! 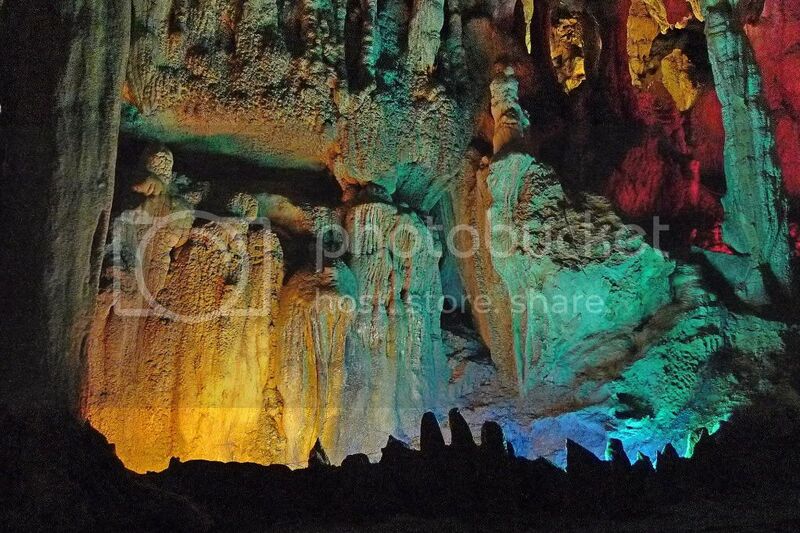 I really do not know the Chinese name of this cave we visited in Yangshuo but Jam told me it's called Ju Long Tan. 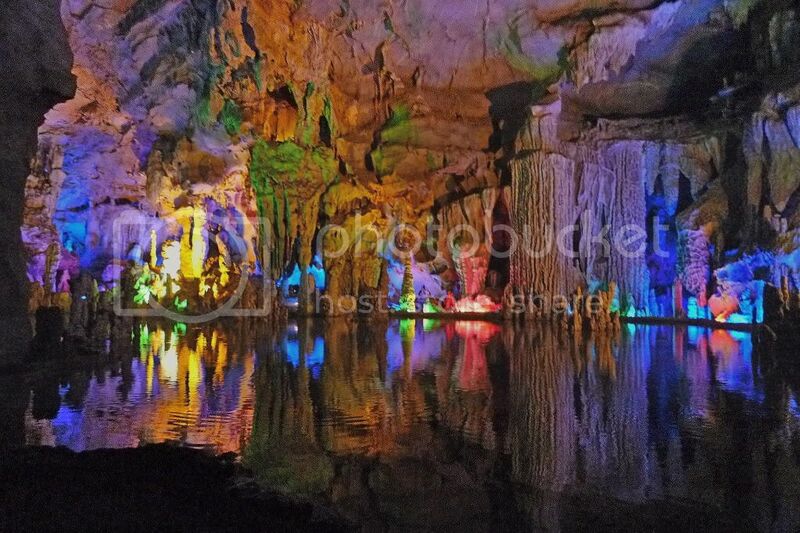 Translated to English, it means Assembling Dragon Cave, but it also goes by the name Dragon Pool. Having passed by Moon Hill without even a stop for us to take photos, our tour bus reached Ju Long Tan, our fourth destination on the tour's itinerary. 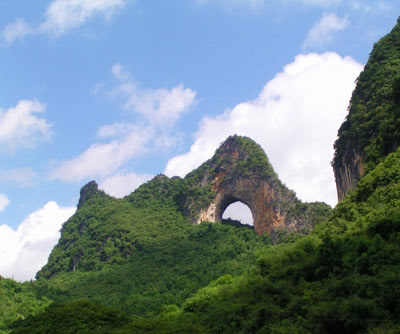 Actually, this place is located 6km south of Yangshuo County between The Big Banyan Tree and Moon Hill. So we actually went from Banyan Tree to Moon Hill, then made a U turn to Ju Long Tan. Our tour guide told us that our fifth and final destination, Exotic Stone Palace was located just next to Ju Long Tan so this would actually be our last stop. 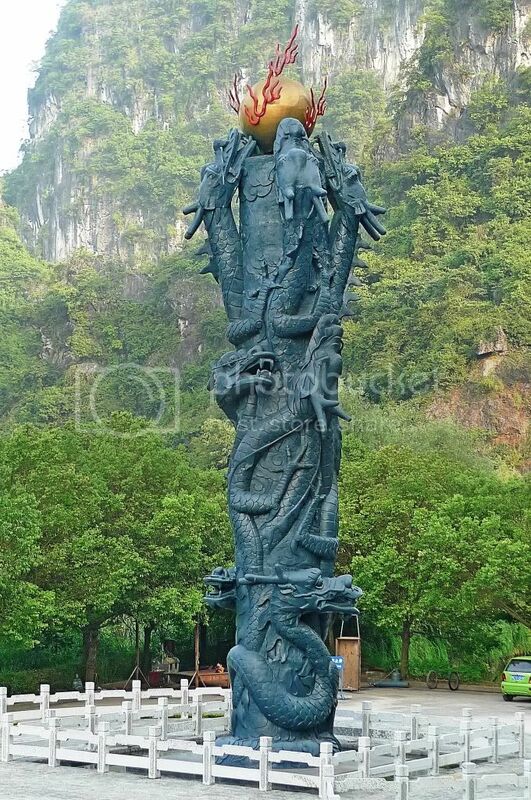 This tall structure with sculpture of dragons climbing up the pole to reach the pearl greeted us at the entrance. We were asked to have our photos taken for free with this structure in the background. So I happily went to have my picture taken, but guess what? 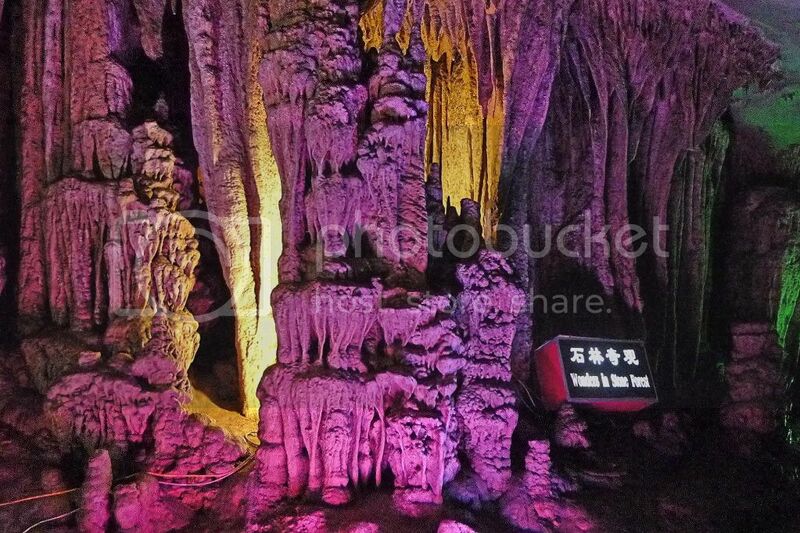 After we came out of the Ju Long Tan cave, we were asked to pay (I could not remember how much) for our photos! Free my foot! Jam, his friend and I refused to pay. Why should we? I could easily ask Jam to take my photo standing beside that dragon structure for free! In fact, we could easily take each other's picture so there's no reason to pay somebody to take our photos for us! I also snapped a picture of this building on top of that flight of stairs. Wonder what do the Chinese words mean? Can you help me out here, Jam? 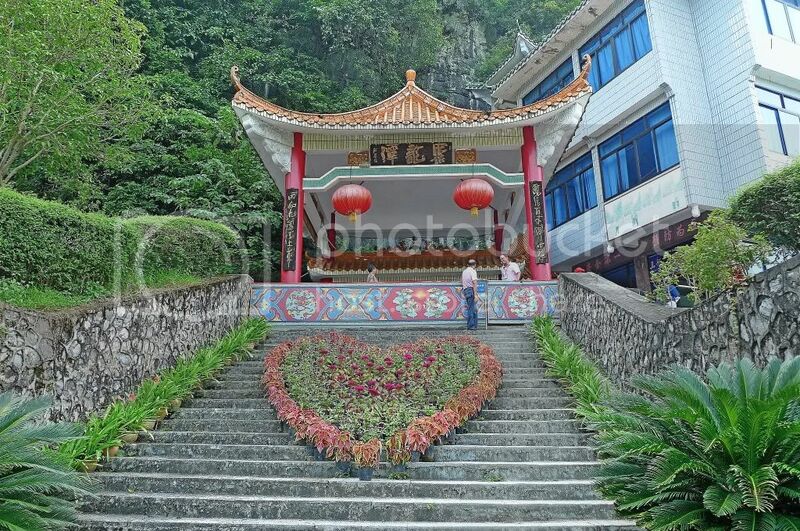 I just thought the plants cut in the shape of love at the middle of the stairs were pretty interesting. 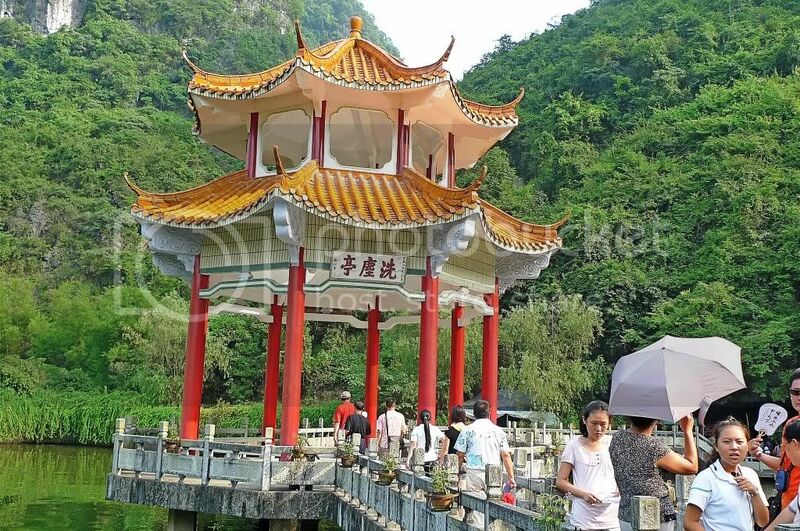 Following the tour guide, we reached a nice looking gazebo with roof shaped like pagodas by the pond. I thought the gazebo really stood out! We soon reached the entrance of the cave. The interesting part about this Ju Long Tan is that you need to enter by way of a boat! This is because it is surrounded by water! I do not really know why it is called Assembling Dragon Cave. 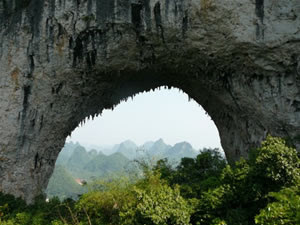 Perhaps the grotesque peaks outside the cave are like dragons jumping over the clouds. 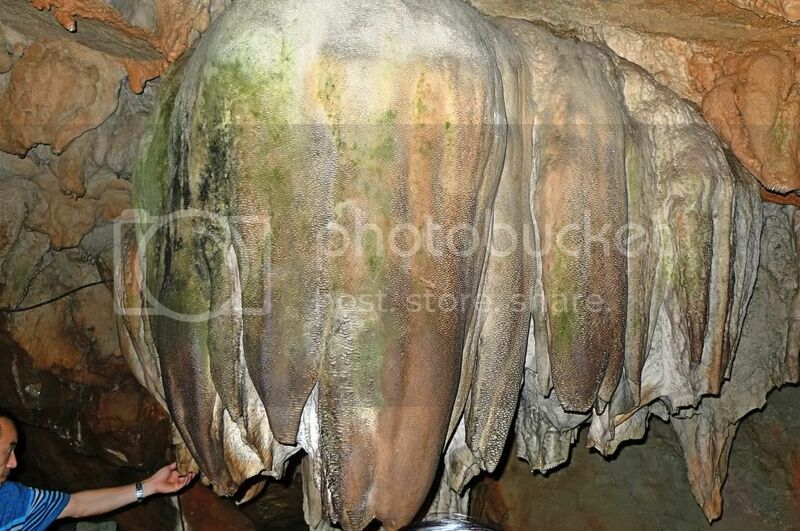 Or the varied appearance of stalactites in the cave are like teasing water dragons. 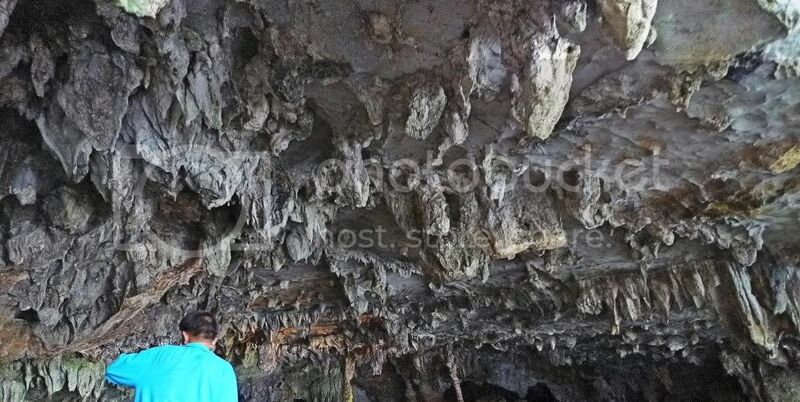 I took a picture of the stalactites above my head as I sat in the boat. Once we reached inside, we got out of the boat and beautiful sights greeted us! 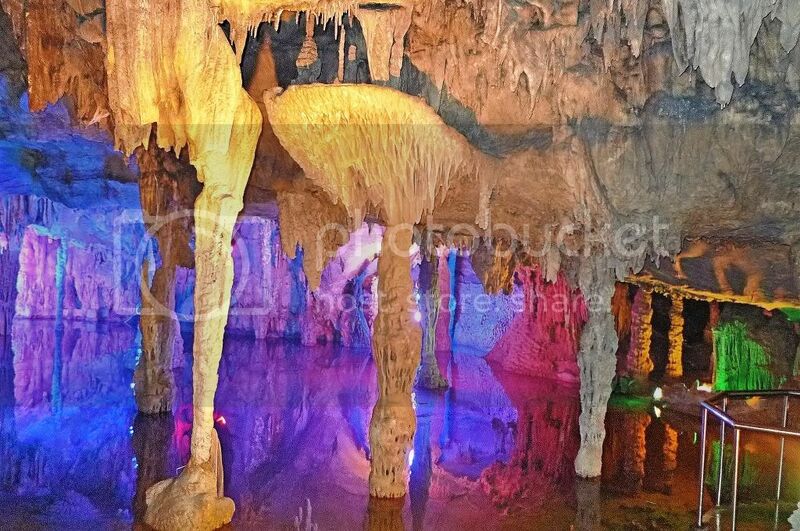 There was a lot of water all around and the reflection of those stalactites on the water was mesmerizing. 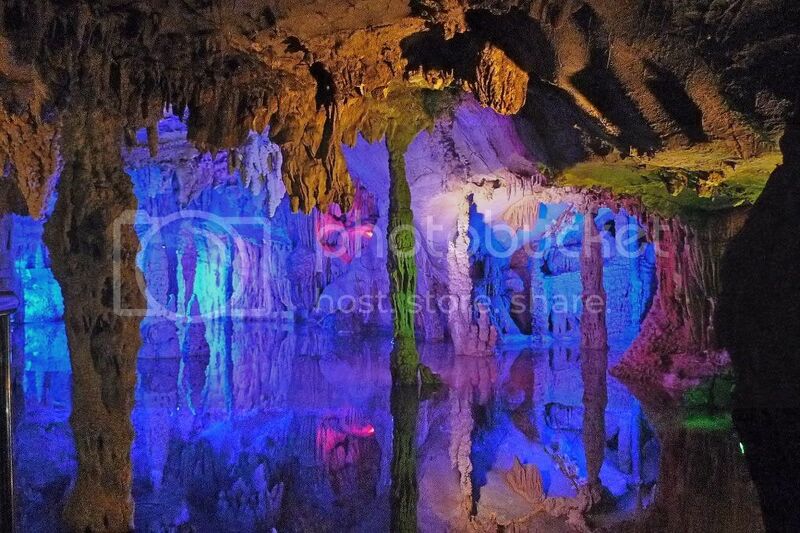 Of course the colourful lightings helped to bring out the beauty of this cave and transformed it into some sort of wonderful fairyland. 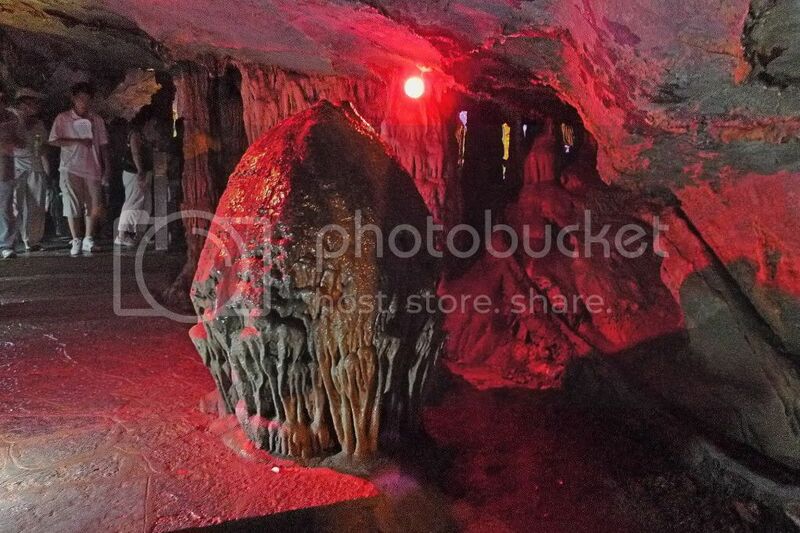 I have to admit taking photos in this dark cave was a huge challenge and many of the photos I took had to be deleted. There were actually many names for all the different rock formations. Among them were Dragon Daughter Meeting Guests, Peach Banquet, Concubine Bathing, Peacock Show, Bright Moon Above The Sea, Inverted Snowdrops and A Phoenix Drinking Dewdrops just to name a few. I did not bother as after seeing so many different names, I was not even interested any more! But I did capture Bright Moon Above The Sea, which was that last photo in my previous post on Moon Hill. Didn't quite look like a moon to me, but well it was just a name given to a hole in the wall! 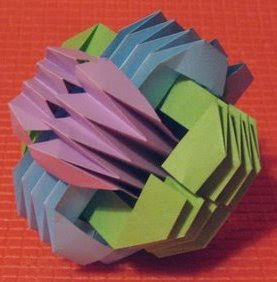 Now, what does this look like to you? Rather ugly looking, no? 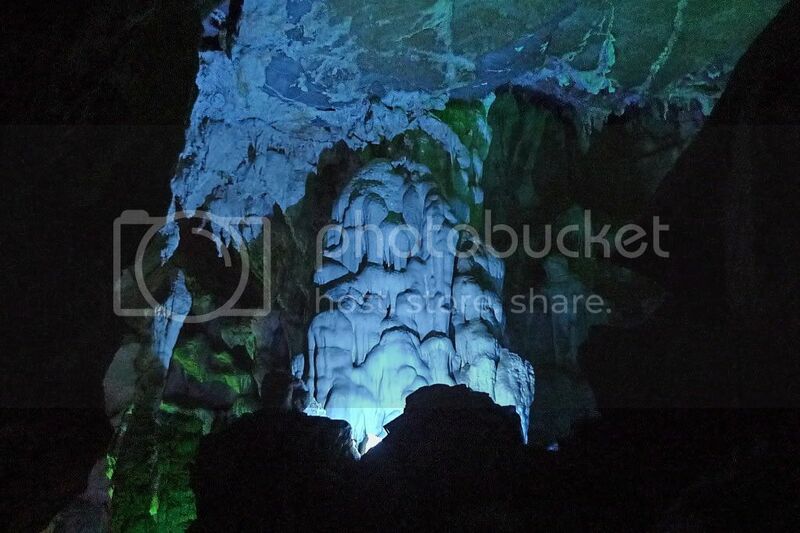 In fact, without the colourful lights, all these stalactites and stalagmites would seem pretty ugly. Or maybe I just do not know how to appreciate them! Oh, here's another hideous one! Does it look like a scene from the movie "Aliens"? Haha! OK, I guess this one was not that bad! Can you make out those words? I think it's Wonders In Stone Forest, or something like that! 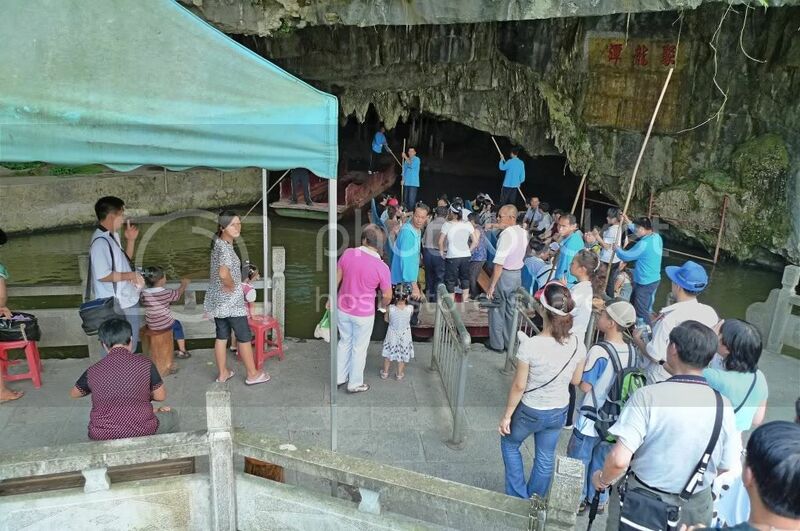 After spending about 40 minutes touring the cave, we queued up for the boat to take us out. Near the exit, we alighted from the boat and saw these two signboards on the wall. We were about to touch a dragon! 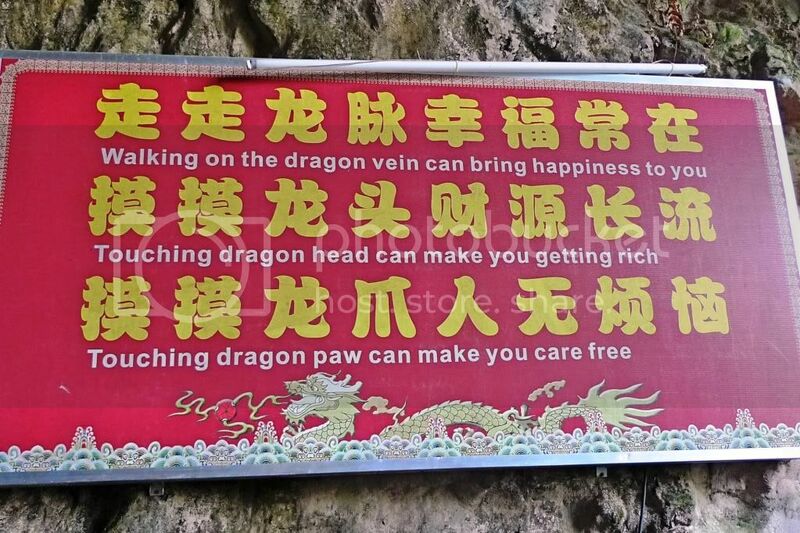 Well, if touching a dragon's head can make me rich, why not? 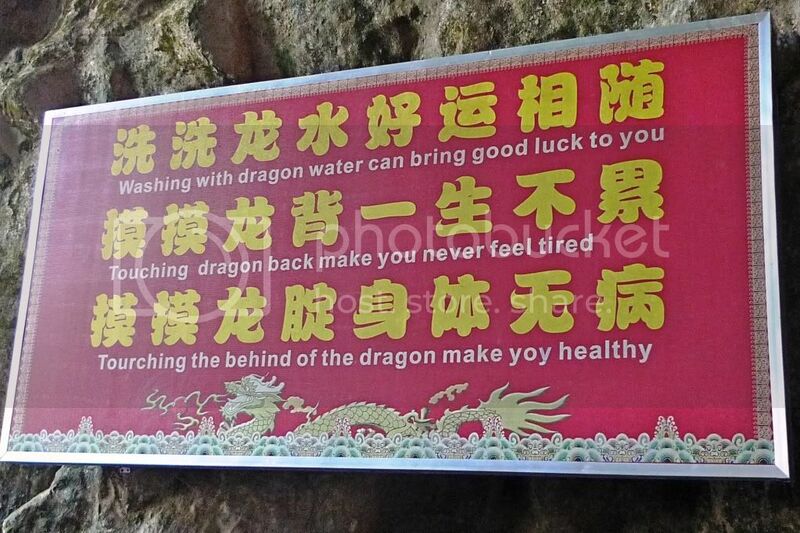 And if touching the dragon's behind can ensure good health for me, why not? Of course, it's not a real dragon. Because real dragons do not exist except in old, ancient Chinese folklores! Maybe the Chinese stumbled upon skeletons and bones of dinosaurs and assumed they were dragons! 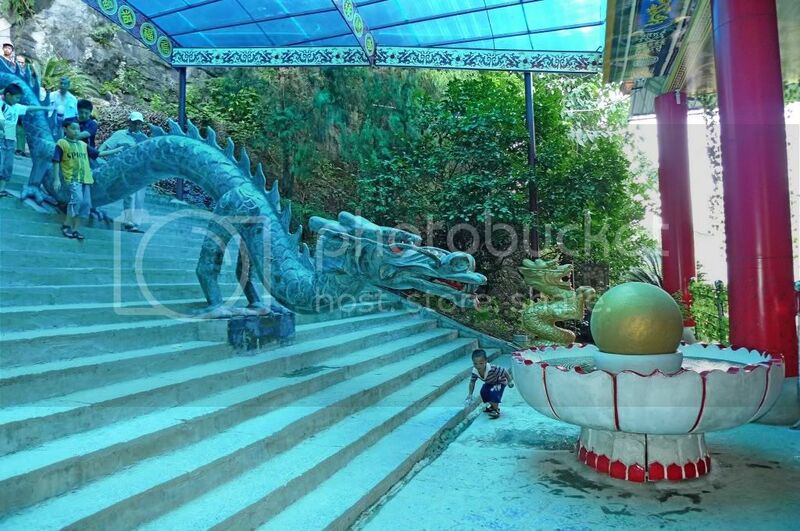 We walked down that flight of stairs, touching the dragon from its tail end all the way to its head! Now that was fun! If I get rich in a few months time, I will let you all know! Haha! After exiting from Ju Long Tan, we entered the Exotic Stone Palace next door. I did not take any photos here as I did not stay long. There were all types of stones and souvenirs being sold here. 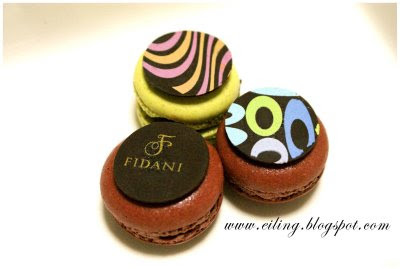 It is a place where the tour guide makes lots of commission from our purchases and I don't intend to buy anything! 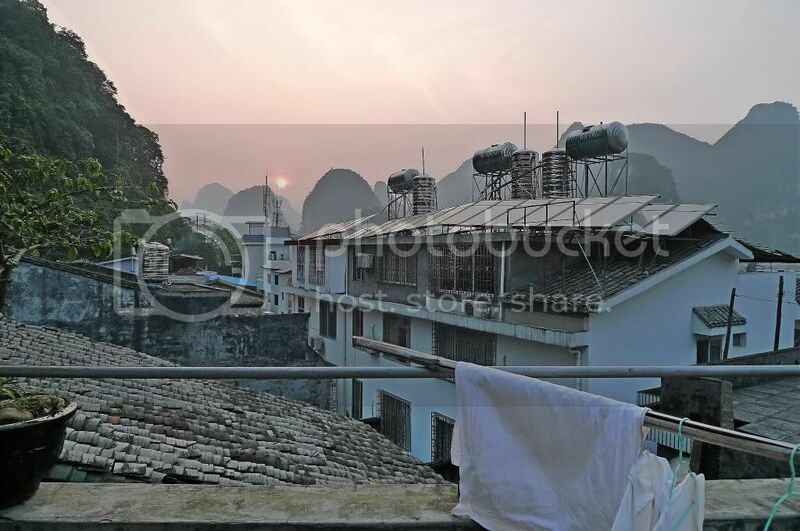 With the tour ended, we went back up the tour bus which would take us to our hostel in Yangshuo. And so, here's the million dollar question - Did we pay the tour company? To know the answer to that, don't miss my next post coming right up! 20th September 2009. A Double Match. Last year, the special day was on 20th August. That gave us 20082008. So next year it will be 20th October which gives us 20102010. It so happens that today is also a big day for Muslims as it is the first day of Hari Raya! So to all my Muslim friends and readers, I would like to wish you Selamat Hari Raya! While everyone was obsessed with the number 090909 on the 9th September 2009, I am more attracted to this date 20092009. I wonder what is so special with 090909 - it reminds me of the emergency number 999! Certainly not a good number to me especially if it has something to do with emergencies! Well, I am not really obsessed with numbers. If you want to know what I'm obsessed with, read here. But a lot of people are obsessed with numbers! I do know that most Chinese people will avoid the number 4 like the plague. They won't want to be caught dead with number 4 on their car plate, house address and even handphone number! That's because the number 4 sounds like death in Chinese. You want to know what I think? I really think that's superstitious crap! As for Westerners, they avoid number 13 as much as possible. Because 13 is deemed an unlucky number. Why? 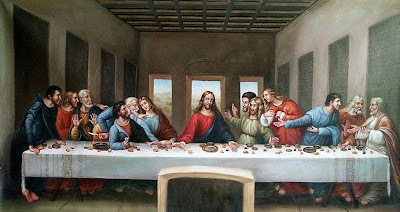 Maybe because there were 13 people at Christ's Last Supper and Jesus Christ was crucified on Friday the 13th. But guess what? 13 is a lucky number to the Chinese. It means "sure to live" in Chinese! 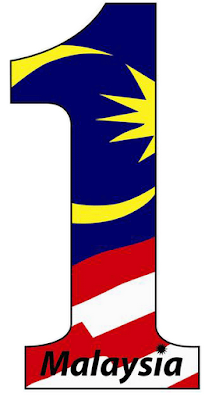 Of course, nowadays in Malaysia we are obsessed with the number 1. Not that we want to be first in everything we do since I don't think we are as kiasu as the Singaporeans but we are certainly getting there. We see the words 1Malaysia everywhere - in the newpapers, on TV and even hear it on radio. 1Malaysia fever is happening right here in Malaysia thanks to the Prime Minister! And also thanks to him, we will soon be having our very own 1Malaysia F1 Team! But is 1 such a good number? I can't help thinking that 1 is a lonely number. No wonder they say it's lonely at the top! 2 is a better number, no? At least we can go out 2 by 2. Not so lonely, haha! Have you heard of the 2 second rule? 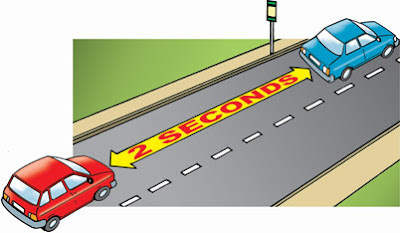 That is to make sure you are at least 2 seconds from the vehicle in front when you are driving. To do that, watch the vehicle in front pass a landmark or an object (eg. lamp post or tree). Once it passes the landmark or object, start counting "1 second, 2 seconds". If your car reach that landmark or object before 2 seconds, you are way too near the vehicle in front and you need to slow down. By the way, have you heard of this funny quote? "A man is a person who will pay 2 dollars for a 1 dollar item he wants. A woman will pay 1 dollar for a 2 dollar item she does not want". Haha! If 2 is company, then 3 must be a crowd! 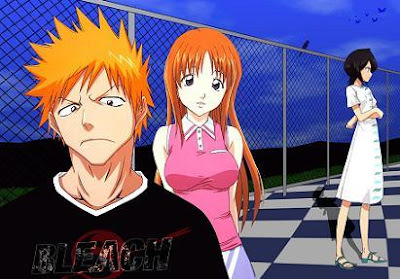 A lot of TV dramas feature stories about 3 people involved in a love triangle. Have you ever been involved in a love triangle yourself? Talking about 3, do you know how to spell water in 3 letters? It's easy! The answer is H2O! Haha! The number 4 is an interesting number. Try this! Think of any number and write it out in words. Then count the number of letters it contains. Write out the number in words and repeat the process. You will be surprised that you will always end up with number 4! The number 5 always remind me of boybands. Maybe because most boybands originally have 5 members. Look at NSync, BackStreet Boys and Westlife! Now here's something interesting about number 6! 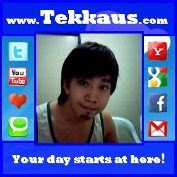 Do you know that whenever two people meet, there are really 6 people present? Don't know what I'm talking about? Analyse this slowly. There is each person as he sees himself, each person as the other person sees him and each person as he really is. Total 6 people! Of course if either one or both of them have multiple split personality, it would be more than 6! Ah! Number 7 reminds me of the 7 wonders of the world! Do you know what the 7 wonders are? No, Petronas Twin Towers is not one of them. If you want to know, read here. But I think there are definitely more than 7 wonders in this world, don't you agree? 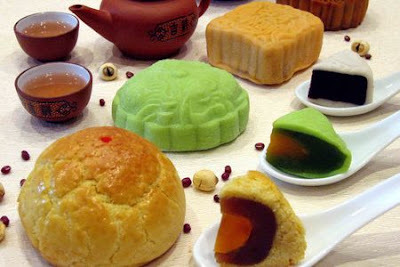 I love mooncakes! Now why am I talking about mooncakes? That's because mooncakes are always cut into 8 pieces! And you know what? I don't like a mooncake to be cut into 8 pieces! That's what most people would do. I prefer to cut it into 4 pieces! Bigger slice for me! Haha! Chinese people always like the number 9. Because 9 symbolizes longevity. No wonder cats have 9 lives! So they can afford to be curious. Curiosity kills the cat, remember? Now if I want to go on, I can blog all the way till number 10,000 and beyond! But I don't think I will because I am not really obsessed with numbers anyway. But wait! I forgot to mention one important number. It's Zero! That's such a funny number! Actually, is zero even a number at all? I mean, how can zero which means nothing is actually something? And do you know zero equates love? You don't? Catch a game of tennis, take note of the score and you will see what I mean! So if love = zero, instead of saying "I love you" can I now say "I zero you"? Haha! After seeing the amazing Big Banyan Tree in Yangshuo, we moved on to our next destination which was Moon Hill. It was not very far away from the Big Banyan Tree, but surprisingly we did not stop there. Instead, as our tour bus approached Moon Hill, the tour guide just pointed and we craned our necks to look up to where she pointed. I did not take any photos as it's difficult to take decent photos on a moving bus. So here are two nice photos I found online. Does that hole in the hill look like a moon? That's why it's called Moon Hill! The moon acts as a natural viewfinder up close. Unfortunately, we did not get a chance to view it from up close. That's because the tour bus did not even stop there for us to take some photos! This is one of the five places we were supposed to visit according to the tour's itinerary. So what the heck is this? Just passing by like "Touch and Go"? In fact, it was worse - we did not even get to touch the Moon Hill! It was more like "Look and Go". I think "SmartTAG" is more like it! Haha! I guess time was limited and the tour guide saw it fit to skip Moon Hill and proceed to the next destination. Well, that may be convenient to her but I felt kind of cheated. This is undoubtedly another good reason not to pay the tour company! Luckily, we managed to see another "moon" later in the next destination. 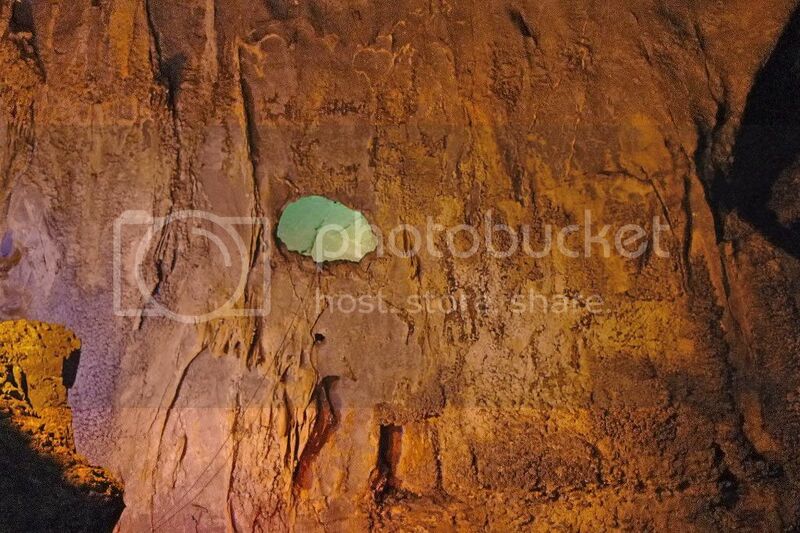 This moon was actually inside a cave! Well, I shall blog about that in my next post, so stay tuned!